Search Results for "eastern medicine"
Massagist doing hands massage in yoga style. Thai massagiste making massage to female hand outdoor. Traditional eastern medicine for treatment and rehabilitation body and spirit health. Professional massagist making thai massage to woman for healing and relaxation. Man doing yoga massage of female leg. Treatment and rehabilitation concept. Eastern medicine. Acupuncture massage concept. Woman receiving thai massage. Professional acupressure massage outdoor. Traditional eastern medicine. Treatment and healing concept. Acupuncture massage concept. Woman receiving thai massage outdoor. Professional acupressure massage. Traditional eastern medicine. Treatment and healing concept. Man massagiste doing yoga massage to woman outdoor. Professional acupuncture massage for healing and rehabilitation body. Traditional eastern medicine concept. Yoga massage concept. Woman getting acupressure shoulder massage outdoor. Acupressure massage for treatment and recovery body after injuries. Traditional eastern medicine. Acupressure massage and traditional eastern medicine concept. Woman getting thai body massage. Acupuncture treatment and rehabilitation body and spirit health. Thai massagiste doing acupuncture massage to woman outdoor. Thai body massage for treatment and rehabilitation body and spirit health. Traditional eastern medicine concept. Woman receiving back massage in yoga style. Man massagiste doing thai massage outdoor. Professional acupuncture massage for healing body and spirit. Alternative and traditional eastern medicine. Woman getting acupressure massage for treatment and rehabilitation body and spirit health. Professional thai massage outdoor. Traditional eastern medicine. Yoga massage concept. Thai massage for treatment and recovery joints and body posture. Professional acupressure and acupuncture massage outdoor. Traditional eastern medicine. Stretching massage concept. Woman receiving yoga massage outdoor. Professional acupressure back massage in thai style. Traditional eastern medicine. Treatment and healing concept. Man massagist doing acupressure massage to female foot outdoor. Close up man professional massagist doing thai massage for body therapy. Traditional eastern medicine. Woman getting hands massage outdoor. Yoga massagiste doing massage to female hand for muscle relaxation and recovery. Alternative and traditional eastern medicine. Woman getting acupressure back massage outdoor. Yoga massage concept. Close up acupressure massage for treatment and rehabilitation body. Traditional eastern medicine. Acupressure and stretching massage concept. Professional thai massage outdoor. Traditional acupuncture massage eastern medicine. Treatment and healing concept. Man massagiste doing acupressure massage to woman outdoor. Thai acupuncture body massage. Treatment and rehabilitation concept. Eastern medicine. Thai massage outdoor. Massagiste doing acupressure massage to woman leg outdoor. Traditional acupuncture body massage. Healing and recovery body. Eastern medicine. Woman receiving thai massage. Man massagiste doing back massage in thai style outdoor. Professional acupuncture massage for healing body and spirit. Alternative and traditional eastern medicine. Woman getting acupressure back massage outdoor. Yoga massage concept. Acupressure massage for treatment and rehabilitation body. Traditional eastern medicine. Man massagist doing massage in yoga style. Thai massagiste doing stretching massage to female hand outdoor. Traditional eastern medicine for treatment and rehabilitation body and spirit health. Thai massagiste doing acupressure massage to woman leg outdoor. Close up traditional acupuncture body massage. Treatment and rehabilitation concept. Eastern medicine. Portrait massagiste doing acupressure massage to woman outdoor. Thai acupuncture body massage close up. Treatment and rehabilitation concept. Eastern medicine. Massagiste doing acupressure foot massage to woman outdoor. Close up traditional acupuncture body massage. Treatment and body recovery concept. Traditional eastern medicine. Body massage in yoga style. Thai massagiste doing stretching massage to woman outdoor. Traditional eastern medicine for treatment and rehabilitation body and spirit health. Foot massage in thai style. Massagiste doing tahi massage to woman foot outdoor. Traditional acupuncture yoga massage. Alternative and traditional eastern medicine concept. Man massagiste doing stretching massage to woman outdoor. Women getting thai body massage course. Healthy and harmony concept. Traditional eastern medicine for treatment and rehabilitation body. 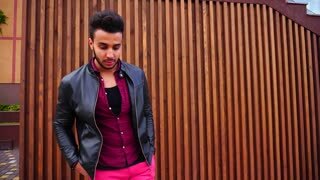 Handsome Young Arabic Guy Posing For Camera and Straightens Jacket or Hair, Smiles and Looks Around on Background of Stairs Outdoors. Acupuncture therapist placing a cup on the back of a male patient, ancient Chinese alternative medicine. Close up for a doctor giving cupping treatment on young man back.